The popular Saddlery and Country Clothing store at Hasketon, Suffolk will be opening their doors from 5.30pm-8.30pm on Thursday 4th July for an evening of shopping, discounts and competitions. A pair of Ariat Derwent Boots are up for grabs in one of the competitions, as well as a 20% discount on all jodhpurs and breeches purchased on the evening. Plus a £50 Kings of Suffolk voucher is being given away with every pair of Ariat Bromont Insulated Boots bought during the event. 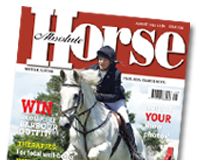 Hertfordshire-based Phillip Miller won the 53rd Hickstead Derby on Caritiar Z. The 36-year old produced the sole clear on the 13-year-old grey gelding, with the later drawn Trevor Breen (Adventure De Kannan) and William Funnell (Dorada) having to settle for second place with four faults apiece, both knocking down the open ditch, near to the end of the course. Last to go Tina Fletcher looked to be having a super round on Promised Land, the exuberant winner of the class in 2011, but the gelding stumbled slightly at the bottom of the bank and unseated his rider, meaning Phillip took home the £36,630 first prize. Considerable improvement in the pain recognition of small animals and humans has been made in recent years, but that of horses has lagged behind.1 Chanelle Animal Health is inviting horse owners from across the country to tell them how they recognise pain in their horses. Your input could help improve veterinary understanding of pain in horses and how the veterinary profession can better help horse owners. To take part please visit http://www.surveymonkey.com/s/QF7HJB9 and complete the short survey.